I was talking to my cousin about her Christmas dinner and how she would like to have the “Reason for the Season” somehow on her table. As we were brainstorming, the idea popped into my head to make nativity characters out of papier mache eggs and Quikwood. The characters could be place card holders for dinner and then be taken home and hung on the Christmas tree. Each year that ornament would stir the memory that was made with it. Her children are my Wednesday afternoon art students, so the following week we just jumped in and began designing our egg nativity. We had the fun of making the project together and Sara and Daniel will also have the joy of giving them as gifts. We thought you might enjoy the project too. Of course, you will need other things like some basic sculpting tools, painting supplies and paint; but I am sure you will have those things or other things you can use. Another product that is wonderful when working with Quikwood is Avon’s Silicone Glove hand cream. It keeps the clay from sticking to your hands. I like to work on a piece of parchment paper or a waxed paper palette. To Begin you will need about 3/8″ of Quikwood to make your feet. Knead it until well blended and divide into two. Roll each piece into an oval. If you would like toes, use a sculpting tool or knife to create them. Then position the fat side of the egg on feet making sure that it is not leaning sideways or front to back. Allow to cure. 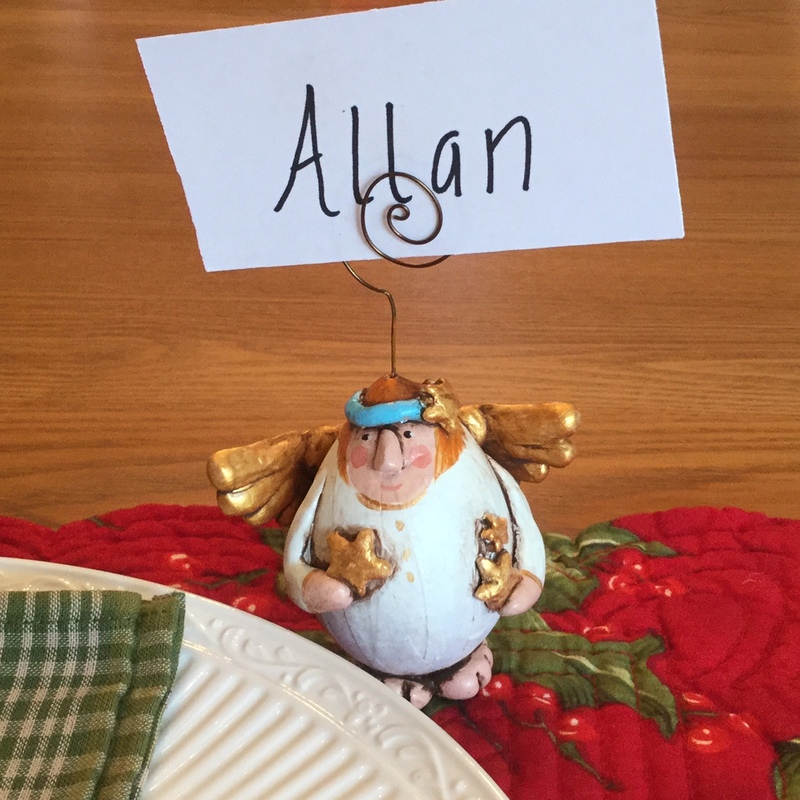 If you are going to use your characters for place card holders/ornaments, you will need to attach the wire on top. Cut an 8″ piece of 20 gauge wire. Fold over about 1 1/2″ from one end and create a flat loop for attaching. Use a small piece of Quikwood to hold onto egg. Blend into egg using DecoArt Extender. Next you will want to make your arms and attach them to the character along with what they are holding. Cut a piece of Quickwood 1/4″+ and mix together. Divide into two and create a coil about 1 1/2″ long with one end coming to a point. Attach to side and bend to hold object. If needed, use a little super glue gel to hold objects in place. Create a coil for the back center. Shape small tear drop for each section on wing and lay in place. Blend clay together using Extender. Now that your wings are made and almost set you will want to attach them to your angel. To finish the angels you will want to add a halo and a star. The other characters will get a head covering. On the shepherds, Joseph and Mary you will add a roping around the top of their heads and on the kings you will add a crown. They all will be completed with a nose. You will then create the top hook for your place card holder/ornament hook. Now all that is left is painting them and antiquing them. I first painted them all Warm White. I then chose some basic colors for skin, hair, and a metallic for wings, crowns, etc. If you are just going to be giving these for individual gifts you can choose any color you want, but if they are going to be on your table I would select a few colors to be used on the characters. It will give a nice unified look to your table. My cousin went with two shades of red, two of green and two tans – this went with her Christmas décor. My living room and dining room are one room. The colors I chose are the accent colors for that room. Hopefully this will give you some ideas on what colors to pick – above all else pick colors you like. I painted my characters with pretty simple faces and limited detail on the clothes. I like antiquing these pieces. It brings out some of the details and also hides some of the flaws. Before antiquing, I sprayed them with a coat of DecoArt matte spray varnish. I like using DecoArt staining antiquing medium. You can mix it 1:1 with the color of your choice. I also like that it has a long open time and you can wipe it back with a damp paper towel. I like to remove a little extra antiquing on the faces and the angel dresses, but keep it heavier in the feet. Once they are dry I seal them with another coat of DecoArt spray varnish. I hope you enjoy these nativity characters and are inspired to create some for family and friends. It is also a fun family project. Since it is Christmas I would like to give away a few of these…..so if you would like to be a lucky winner, leave a comment in this post. Anyone who comments until December 25th at midnight will be entered in the contest. I will pick the winners on December 26th. May you all have a very blessed Christmas and a healthy and happy New Year. Please Email me at alandjanie@msn.com or PM me on facebook with your mailing addresses. I haven’t tried quikwood yet, but it looks very interesting. You’re so creative! I love these and I’m looking forward to getting a head start making them for next year’s Christmas. Thank you for all you share throughout the year! These are the cutest thing I’ve seen in a long time. So so creative. I love these Jane! Very cute! Gosh these are so darling! Thanks for sharing! These are so cute! I am inspired. I wonder if you have tried this using egg gourds? I just hit a dozen! Can’t imagine to ever be so lucky to win one. I would be absolutely overwhelmed. Thanks for making the videos. I love these Fantastic Idea………. (Singing). Angels we have heard on high…. What an adorable idea. I love them. Love these Jane, but also love the fact that you continue celebrating after all the “hub bub” is gone! May you maintain the spirit all year long! Thank you DeDe, Ido agree about the smell. The hand cream does help with keeping it off your hands. I have not tried quik wood yet, will be adding that to my supplies. Thank you for the step by steps, fun characters. Thank you Nina, it is fun to work with. Unique surface and so cute, and quik wood too. These are so unique. Very creative. Beautiful. These are so original and I love them. Very cute! Thanks for the opportunity! I haven’t tried QuikWood, but plan to try it this coming year. Love your characters you created. They are adorable… love them.. thanks for the tutorial on them.. and the chance to win one!! These are SOOOOO adorable – love them! I am really enjoying looking at all the many different things you have made and continue to make. They are very unique and you are so talented. You make it look so easy!!!!!!! Thank you Mary, once you get the hang of quikwood the possibilities are endless.